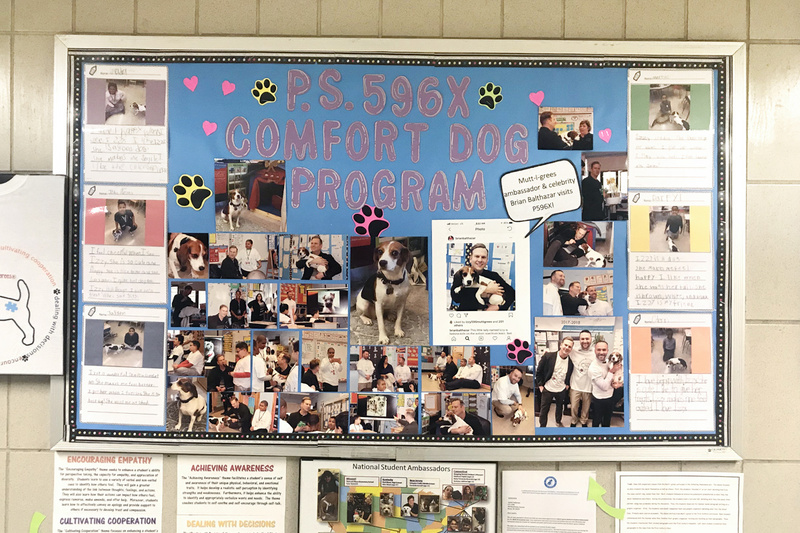 National Student Ambassador, Jaydon Holloman, was able to combine his passion for both rescue and humor by organizing a special Mutt-i-grees Curriculum Day at his school PS596X in the Bronx, New York. 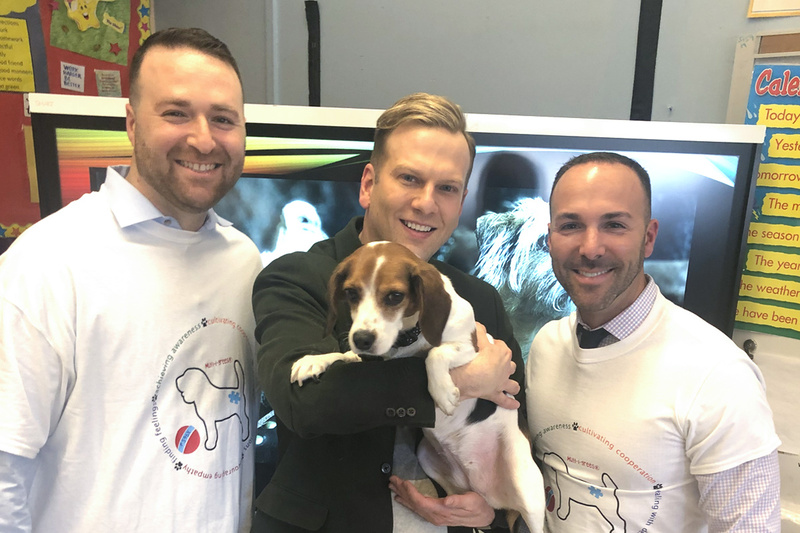 Comedian, TV personality, and TV producer Brian Balthazar, visited our Mutt-i-grees National Student Ambassador Jaydon and the Mutt-i-grees School Dog Izzy, at PS 596X to have a conversation about rescue pets. The students read their letters to Brian about all they’ve learned through the Curriculum. They also asked Brian questions about his pets and how he supports rescue as a celebrity. Aspiring comedian, Jaydon, shared his talent with the appreciative audience, including Izzy! 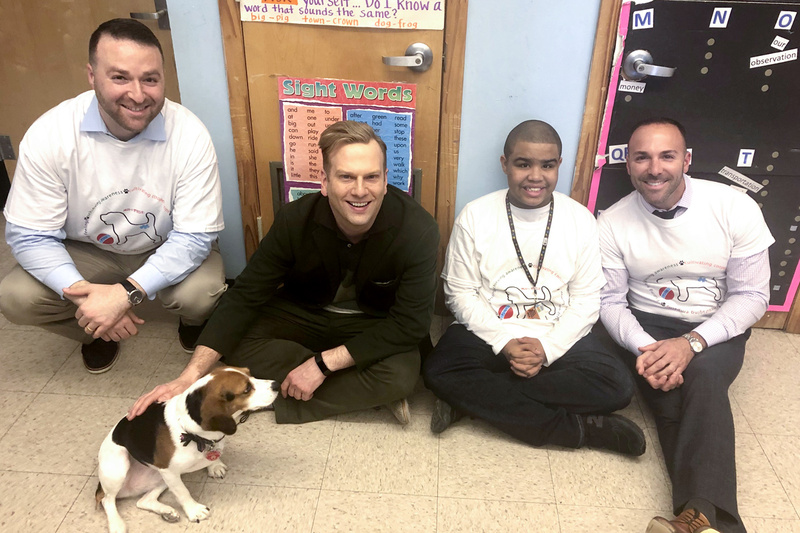 Left to right: Tre Schlesinger (Teacher, Izzy’s Guardian), Brian Balthazar, Jaydon Holloman (Mutt-i-grees National Ambassador) and Principal John Siracuse. Brian was thrilled to meet the students and witness firsthand the life-changing impact that Izzy’s had on their lives. PS 596X is the largest public school in the nation for children on the autism spectrum. Brian listened to the students tell him how Izzy helps them to feel calm and happy. He witnessed how Izzy helps them to cultivate empathy and open up to speak about their feelings. Left to right: Tre Schlesinger (Teacher, Izzy’s Guardian), Brian Balthazar and Principal John Siracuse. Some of the children Brian met had been withdrawn and are now, due to the impact of the School Dog and the Mutt-i-grees Program, speaking and connecting with other students and people. “I’m so humbled and touched by the experience and I wish I could go back every day. The kids are all rays of light,” said Brian. We thank Brian for taking the time to visit these amazing children. His presence at the school brought excitement and fun! We are grateful to have Brian, the student ambassador, and the teachers at PS596X supporting our rescue mission. A special thank you also goes to Principal John Siracuse who made this all possible. “I certainly look forward to a long-lasting relationship with North Shore Animal League America and the Mutt-i-grees Program,” exclaimed John. Also, don’t miss their 101 Dalmatians school play on May 21 and May 29 @ 10:30 in their school auditorium. Principal Siracuse said do not come without a box of tissues!